The article reminded me of some of the successful and not-so-successful undertakings of this blog. I need to post more “projects” like this. I’m thinking about tea infusions and rosé vermouth for spring. Two of Moskin’s recipes caught my eye. 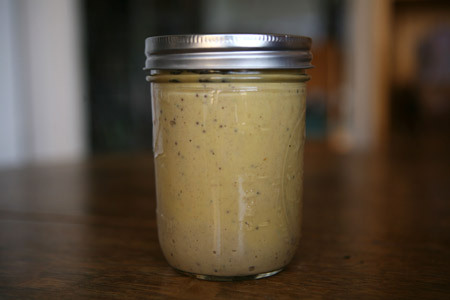 Horseradish beer mustard. Photo by Hiroko Masuike for the NYT. In a bowl, whisk together 1/2 cup dry mustard, such as Colman’s; 1/3 cup sweetish dark beer, such as Brooklyn Local 2 or Negra Modelo; 1/2 cup drained prepared horseradish (a 6-ounce bottle); and 1 tablespoon brown mustard seeds. Season with salt and pepper to taste. Cover and refrigerate overnight to let the flavors calm down a little. The next day, taste again for salt and pepper, and whisk in a little more beer if the mustard seems too thick. Store in a sealed container in the refrigerator. Use it to elevate a simple dinner of sausages, roast chicken or steak. Vin d'orange. Photo by Hiroko Masuike for the NYT. Your citrus should be organic and clean, because anything on the peel will end up in the wine. You will need 3 tangerines or oranges with a good balance of tart and sweet plus 2 lemons or grapefruit, or one of each. Slice them in thick wheels and place them in a clean container (glass or hard plastic) with a wide mouth and a tight-fitting lid. Now add 1 1/2 cups sugar; half of a vanilla bean, split lengthwise; a cinnamon stick, about 4 inches long;2 liters rosé; (about 2 1/2 bottles), and a cup of vodka. Stir this well with a spoon (not wooden, as it may harbor bacteria that could inhibit fermentation) and fasten the lid. Keep the jar in the refrigerator, shaking occasionally to dissolve the sugar. After about 6 weeks, mix in 1/4 cup dark rum and strain everything through a fine strainer or several layers of cheesecloth. Store in bottles at a cool room temperature or in the refrigerator; it will last indefinitely. Lovely plain or mixed with sparkling wine or water. 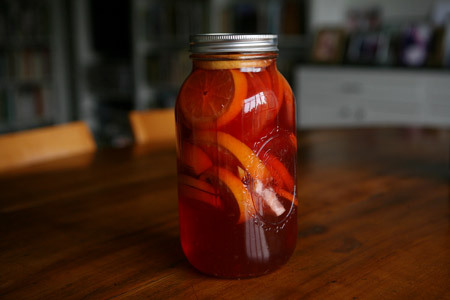 Adding vodka before secondary fermentation? Very, very curious.